Let your mats do twice the work, while they protect your floors and mark important areas around the store for your customers. • Point out the deli, bakery, or salad bar! There is a choice of options in our Grocery and Supermarket sections. 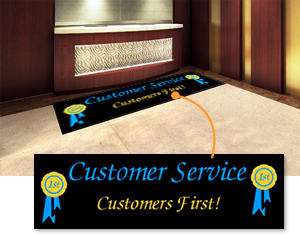 • Attractive design, colors, and relevant graphics make these mats hard-to-miss. • Nylon yarn mats brushes and scrapes the dirt effectively keeping the floors clean all day long. • 3' x 10', digitally printed, and easy to clean.